The android operating system is no doubt the most customizable mobile platform at the moment. Android offers you a whole lot of awesome features that makes you take full control of your device. As much as most of us might think we are familiar with the android OS, there are lots of hidden features that many of us still don't know about. In this post, I will be sharing one of them and it's called screen pinning. 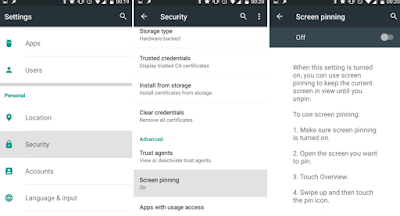 Screen pinning is one of the security features available to android 5.0 and above. It allows you to pin only one particular application to the screen. What this means is that anyone using your smarphone will only have access to just the pinned application only. This feature comes in handy when you are trying to keep your friends from going through your personal apps or you are trying to keep your important information from third parties while they make use of your phone. >> Open your phone settings and click on security. >> Scroll to the bottom and click on screen pinning under advance. >> Tap on the switch at the top to enable screen pinning. >> Open the app you want to pin. >> Drag the app you want to pin until it's in the middle of the screen. >> Tap on the blue pin icon at the bottom right corner of the app you want to pin. >> After that, just confirm your action and the app will be pinned to your screen. >> To unpin the app, just hold down both the overview and back button simultaneously for a few seconds. That's it guys, with this little trick you can be rest assured that your information is very safe even when you give your phone to other people to use.